When will be Mexico Life next episode air date? Is Mexico Life renewed or cancelled? Where to countdown Mexico Life air dates? Is Mexico Life worth watching? From the warm Caribbean waters of Playa del Carmen to Pacific Coast destinations like Puerto Vallarta and Cabo San Lucas, we're following homebuyers in search of sun, sand and surf. Whether it's a vibrant nightlife and sizzling culinary scene or a totally secluded piece of paradise these buyers crave, local realtors will help them find the perfect property for their own slice of Mexico heaven on HGTV's Mexico Life. Single father Art feels he misses out on time with his two kids because of his busy job, so he decides to sell his business in Arizona and relocates to San Carlos, Mexico. Kelly and Steve get ready to move to Puerto Vallarta, Mexico, after getting engaged there, and leave behind their busy lives in Southern California. Colorado couple Allison and Gordan look for a property close to the beach in Nuevo Vallarto so they can have 365 days of summer. Inspired by others that have done it before them, a Minnesota couple ditches their harsh winters for the healing sunshine of Playa del Carmen, Mexico. They're hoping to find a large, private home perfect for hosting their seven children and their families. Will they find their sunny forever home in this dream location? A young couple goes into business after buying a local bookstore in their favorite vacation spot of Puerto Morelos, Mexico. They're tired of cold winters and are looking forward to the perfect year-round weather. This could be a risky move but will they find their dream home in their favorite spot? After she and her friends discovered Cabo San Lucas, Mexico, a Tennessee woman is eager to introduce the laid-back town to her husband and son. The family falls in love with the atmosphere and outdoor activities that Cabo offers but they can't agree on whether a condo or house would be the best fit. Will they be able to find the perfect ocean view property they've been dreaming of? Steve, a golf professional from Arizona, fell in love with the stunning scenery in San Carlos during his first visit and wants to help its golf community grow. He's entrusted a broker with finding him a large lot with an ocean view on a tight budget. A pair of racquetball enthusiasts look to spend the rest of their lives together in Mazatlan, Mexico. South Dakota couple Brad and Kevin are looking for a condo in Puerto Vallarta that has both mountain and ocean views. Newlyweds looking for a change of pace from the hustle of California's Bay Area are ready to spice things up with a new life in Cabo San Lucas, Mexico. Tired of long winters, a Canadian couple looks to escape to Isla Mujeres, Mexico, where they've vacationed for years and fallen in love with the stunning waters and Mexican lifestyle. 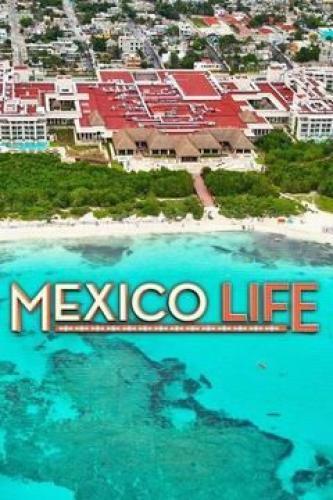 Mexico Life next episode air date provides TVMaze for you. EpisoDate.com is your TV show guide to Countdown Mexico Life Episode Air Dates and to stay in touch with Mexico Life next episode Air Date and your others favorite TV Shows. Add the shows you like to a "Watchlist" and let the site take it from there.